Showing items in category Palestine, sorted by newest listed first. PALESTINE - 1919 inward picture postcard from Egypt with PALESTINE/CENSORSHIP/No.8 h/s. 1919 inward picture postcard from Egypt struck on arrival by black PALESTINE/CENSORSHIP/No.8 h/s. 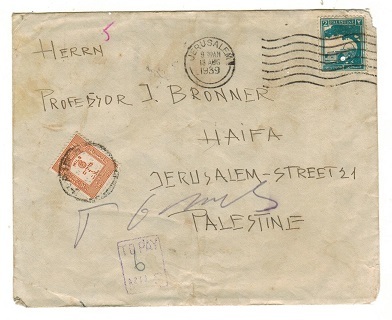 PALESTINE - 1948 5m local 'Interim' cover struck SAFED in red ink. 1948 (MAY.12.) local cover bearing 5m adhesive tied by SAFED 'Interim' cancel struck in red ink. Listed at $300 by Bale. 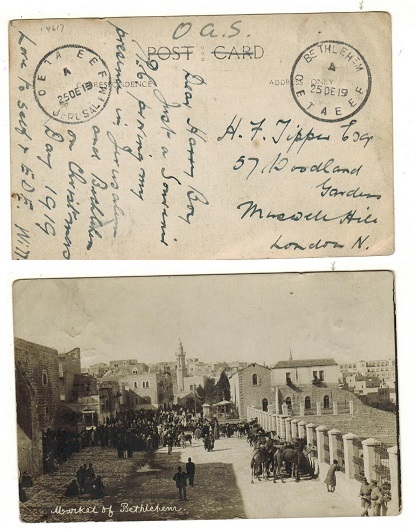 PALESTINE - 1919 'OAS' postcard use cancelled BETHLEHEM/O.E.T.A./ E.E.F to UK. 1919 (DE.25.) 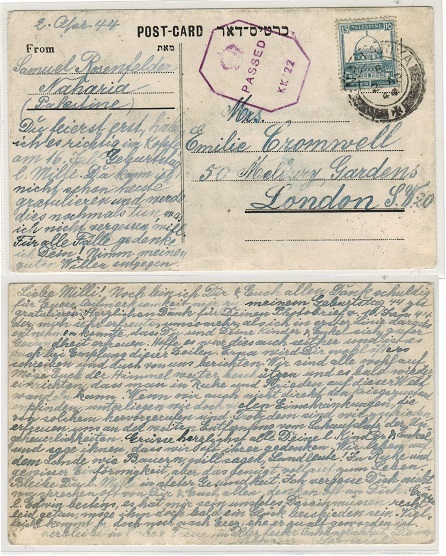 stampless postcard addressed to UK marked 'O.A.S.' and depicting a real photo of 'Market Of Bethlehem' cancelled by scarce BETHLEHEM/O.E.T.A. E.E.F. cds with O.E.T.A. E.E.F./JERUSALEM transit cds at left. A nice card. PALESTINE - 1918 5m on 1p rate 'CENSORSHIP 2' postcard use to Egypt via APO/SZ 44. 1918 (JU.10.) 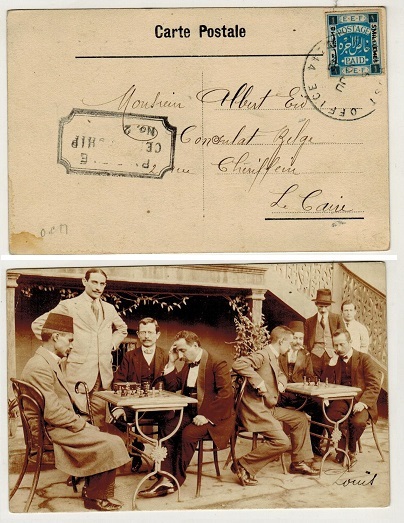 use of picture postcard addressed to Egypt depict 'local chess players at café' bearing 5m black on 1p ultramarine adhesive (SG 4) cancelled by s/r ARMY POST OFFICE/ SZ 44 cancel with black PALESTINE/CENSORSHIP/No.2 h/s at lower left. PALESTINE - 1923 14m rate cover to UK used at AJAMI B.O. 1923 (MY.7.) cover addressed to UK bearing 2m (x2) and 5m (x2) adhesives tied by AJAMI B.O.JAFFA cds's. Proud type D5. PALESTINE - 1922 underpaid postcard used locally with 'TO PAY/MILLIEMES' strike applied. 1922 (JA.18.) use of picture postcard addressed locally depicting 'Mosque El Aksa' bearing 3m adhesive on picture side cancelled by JERUSALEM. The card is marked 'Printed Matter' and it was not origally apparent that the card was stamped and the officials struck the back with the black squared TO PAY/MILLIEMES handstamp before it was realised. 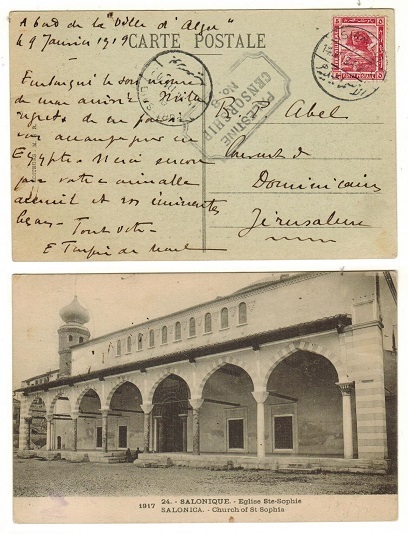 PALESTINE - 1921 6m rate postcard use to France used at JERUSALEM. 1921 (NO.10.) 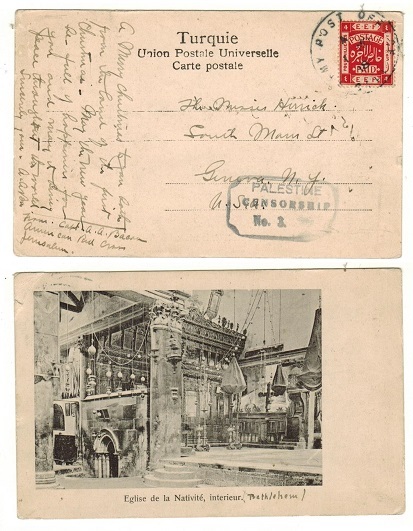 picture postcard addressed to France depicting 'view of Mount Zion' bearing 3m adhesive pair tied to picture side by JERUSALEM cds. PALESTINE - 1918 4m rate 'CENSORSHIP 3' postcard use to USA. 1918 (NO.1.) use of picture postcard addressed to USA depicting 'Eglise De la Nativite' at Bethleheim bearing 4m red adhesive tied ARMY POST OFFICE cancel and with black boxed type PALESTINE/CENSORSHIP/No.3 h/s below. PALESTINE - 1920 1p rate 'O.E.T.A.' cover to Germany. 1920 (MR.12.) 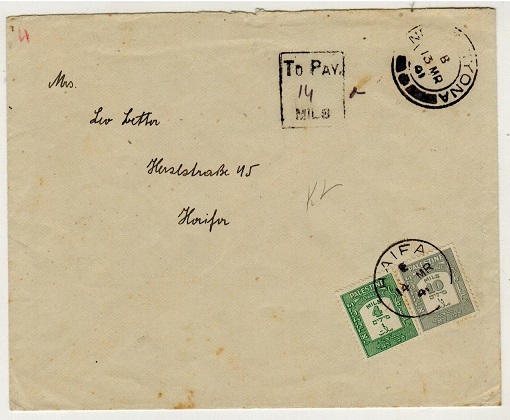 cover addressed to Germany bearing 1 piastre indigo adhesive (SG 10) tied by O.E.T.A.- E.E.F. cds. Light central fold. PALESTINE - 1919 2p rate 'O.E.T.A.' 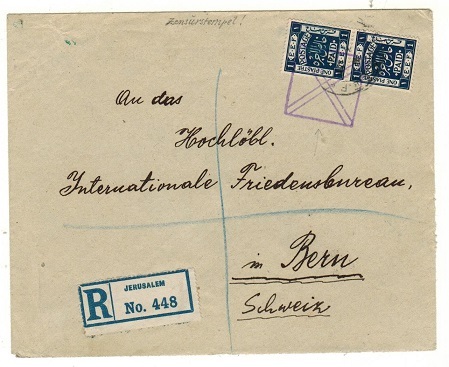 registered cover to Switzerland. 1919 (3.JY.) 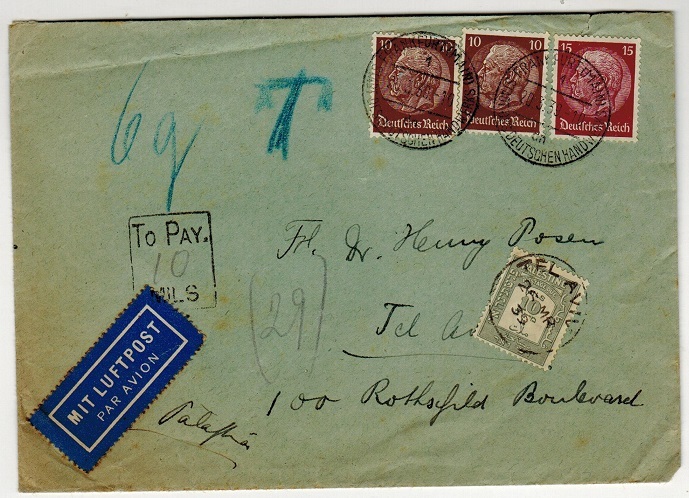 registered cover addressed to Switzerland bearing 1p blue pair tied by O.E.T.A. - E.E.F./JERUSALEM cds and counter struck by violet square with cross banding. BERN arrival b/s. A scarce military censorship. 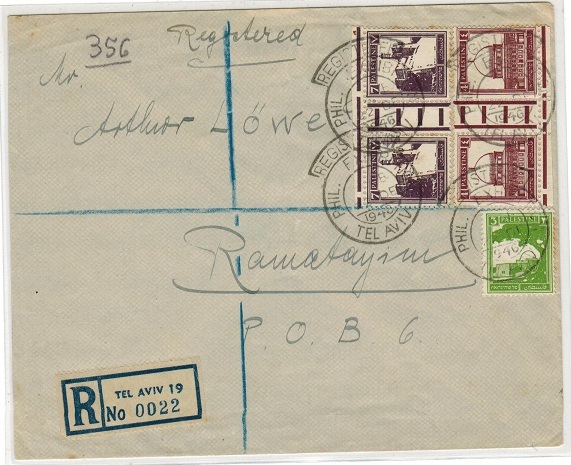 PALESTINE - 1937 unstamped local cover with 10m 'Postage Due' applied at GEDERA. 1937 (AU.6.) 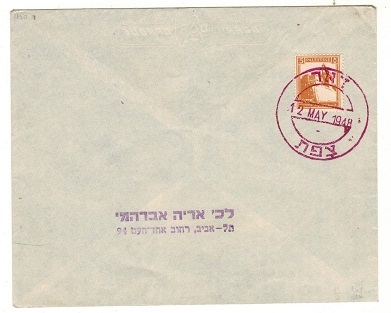 stampless cover addressed locally cancelled by TEL AVIV cds (central fold and punch hole) bearing 10m pale grey 'Postage Due' applied on arrival and tied GEDERA. 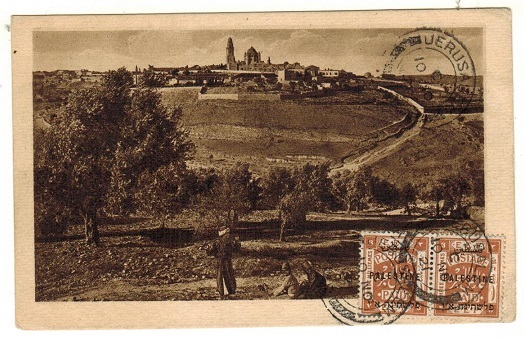 PALESTINE - 1930 (circa) unstamped local postcard with POSTAGE DUE handstamp applied. 1930's (circa) use of unstamped picture postcard depicting 'Navigation Company/R.M.S. Ortega' (some staining) struck on by arabic 'Postage Due' boxed instructional handstamp with '200' inserted in red manuscript. PALESTINE - 1931 3m yellow green postal stationery wrapper mint SPECIMEN. H&G 2. 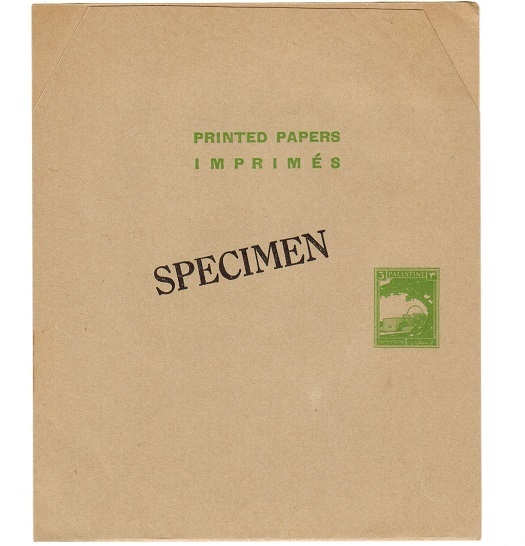 1931 3m yellow green on buff postal stationery wrapper in unused condition diagonally struck SPECIMEN on front in black. H&G 2. PALESTINE - 1927 4m IMPERFORATE PROOF in apple green. Complete with certificate. 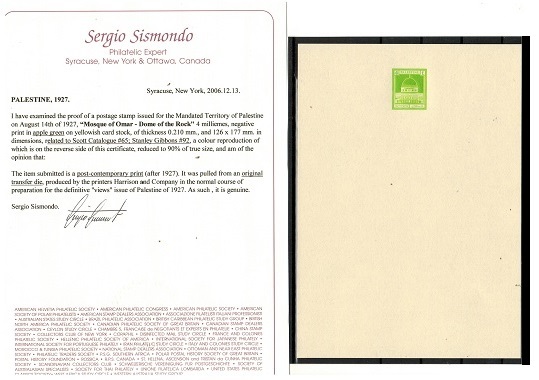 1927 4m IMPERFORATE PROOF (SG type 10) printed in relief on cream (125x178mm) card in bright apple green and complete with Sismondo certificate stating 'Genuine pull from original transfer die post 1927'. PALESTINE - 1927 4m IMPERFORATE PROOF in red. Complete with certificate. 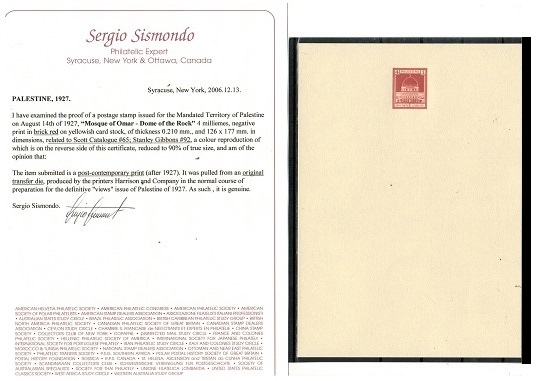 1927 4m IMPERFORATE PROOF (SG type 10) printed in relief on cream (125x178mm) card in brick red and complete with Sismondo certificate stating 'Genuine pull from original transfer die post 1927'. PALESTINE (Turkey used in) - 1899 20pa postcard to USA used at JERUSALEM. 1899 use of picture postcard to Germany depicting 'Jerusalem Mit Gethsemane' bearing 20pa adhesive tied by d/r JERUSALEM cds. PALESTINE (Turkey used in) - 1898 1pi rate cover to USA used at JERUSALEM. 1898 (MAI.1.) 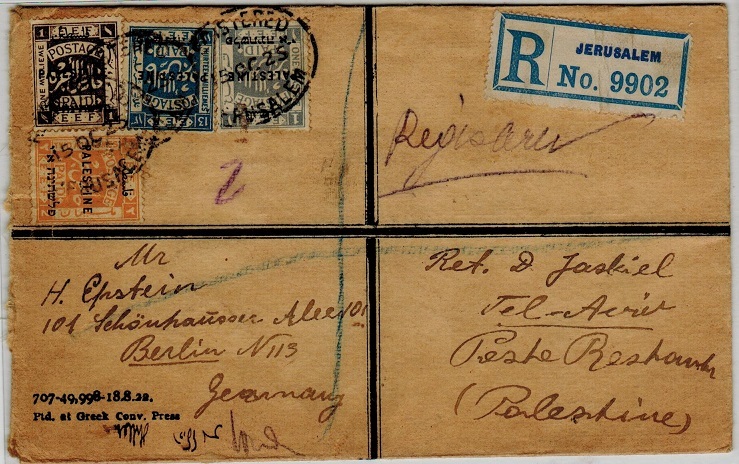 cover addressed to USA bearing Turkish 1pi adhesive (corner fault and slightly reduced at left from opening) tied by d/r JERUSALEM cds. 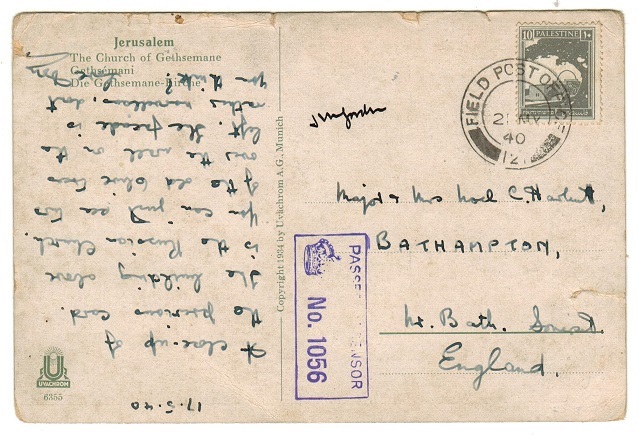 PALESTINE - 1925 use of 'PALESTINE POSTS & TELEGRAPHS' envelope from JERUSALEM. 1925 (OC.21.) 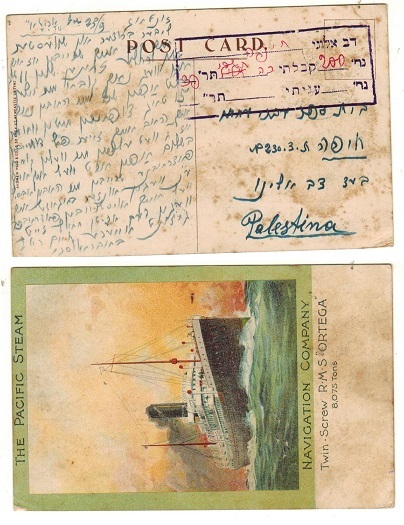 use of (No.366) PALESTINE POSTS & TELEGRPAHS envelope addressed to locally cancelled by d/r JERUSALEM cds. Proud type D1. 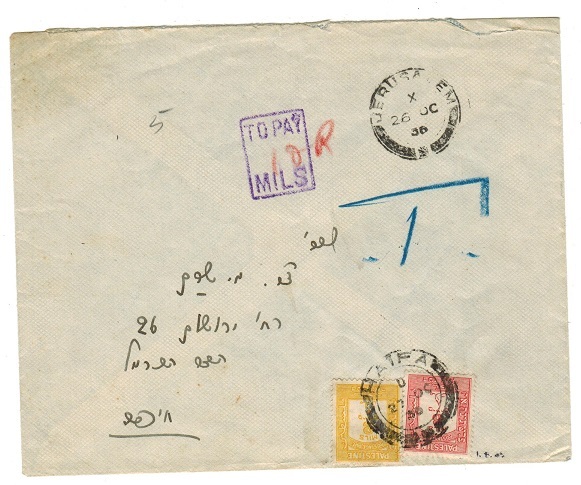 PALESTINE - 1941 local unstamped cover from NES ZIYONA with 4m+10m 'Postage Dues' added. 1941 (MR.13.) stampless cover addressed locally cancelled by NES ZIYONA cds with black boxed TO PAY/MILS handstamp applied with 4m green and 10m grey 'Postage Dues' applied (SG D14 and D17) tied by HAIFA cds of the following day. 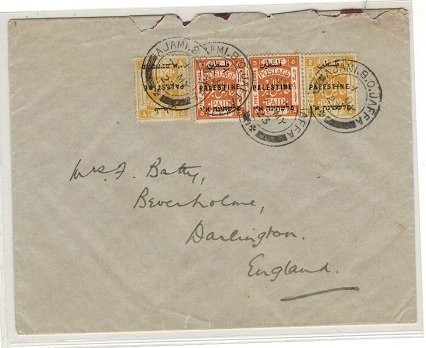 PALESTINE - 1940 inward underpaid cover from UK with 2m and 10m 'Postage Dues' added. 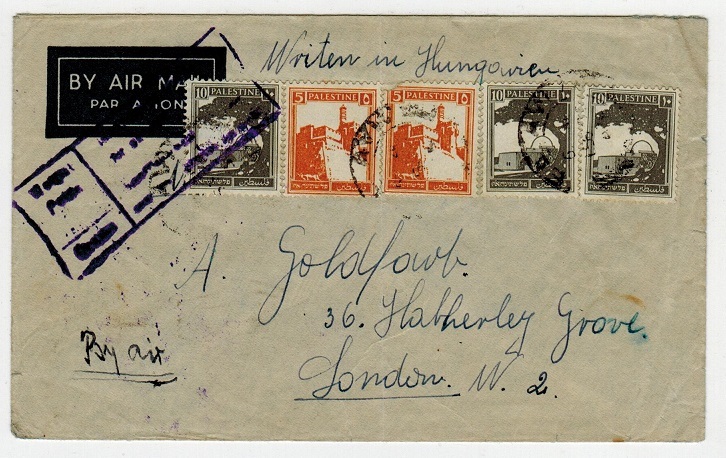 1940 inward underpaid cover from UK with 'TO PAY/MILS' tax mark applied and with 2m yellow (x2) and 10m grey 'Postage Dues' added (SG D13+17) tied by QIRYAT HAIM cds dated 31.DE.40. Struck by violet PALESTINE/PASSED BY/CENSOR/H.20 censor. Little type 2A1. 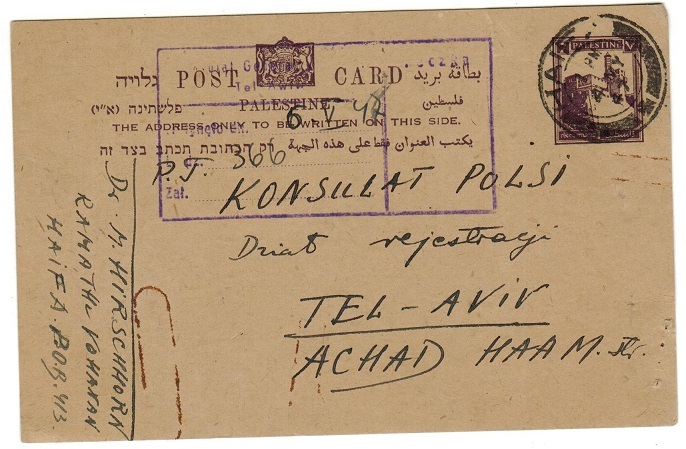 PALESTINE - 1939 38m rate registered censor cover to Holland. 1939 (DE.10.) 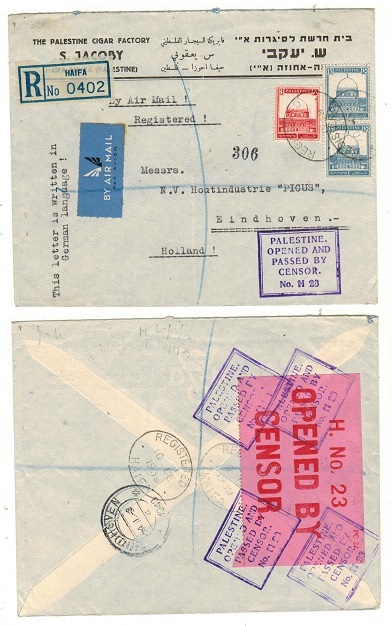 registered commercial cover to Holland bearing 8m and 15m pair tied by oval REGISTERED/HAIFA cancel and with violet square PALESTINE/OPENED AN/PASSED BY/CENSOR/ No. H 23 censor mark applied on front. Little type 1B. The reverse bears a copy of the red on pink H.No.23/OPENED BY/CENSOR label (Little 3A H) similarly struck by violet censor h/s's. A nice early censor use. 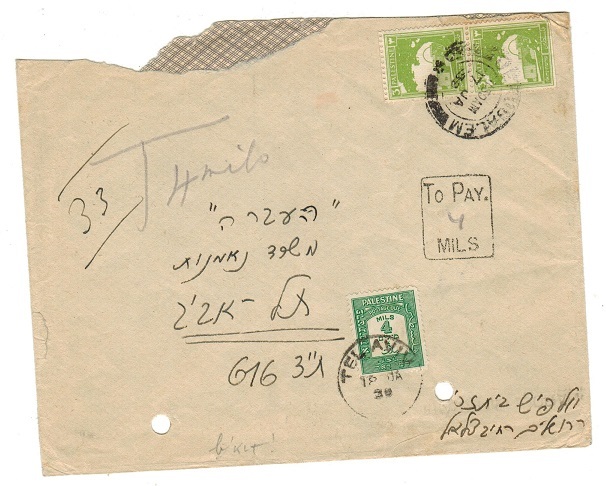 PALESTINE - 1938 underpaid cover from NAHALAL with 2c 'Postage Due' added at HAIFA but returned. 1938 (JY.24.) 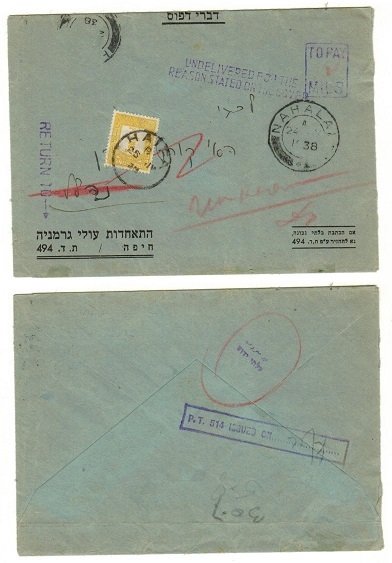 stampless cover addressed to Haifa cancelled by NAHALAL cds (Proud type D4) with 2m yellow 'Postage Due (SG D13) applied on arrival and cancelled HAIFA with violet boxed TO PAY/MILS strike at top. The cover was then struck by violet two lined UNDELIVERED FOR THE/REASONS STATED ON THE COVER h/s (Proud I7) with additional RETURN TO h/s in violet applied. Proud I9. 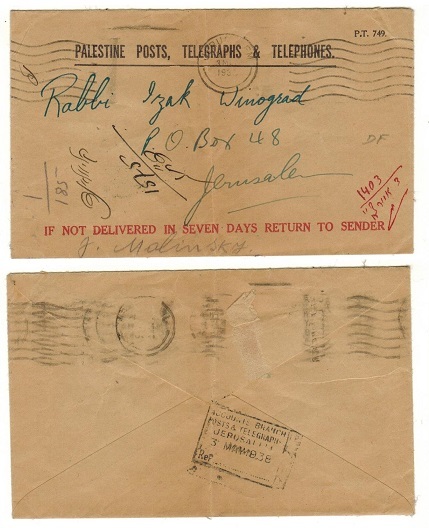 PALESTINE - 1938 use of 'PALESTINE POSTS TELEGRAPHS & TELPHONES' envelope from JEREUSALEM. 1938 (MY.3.) 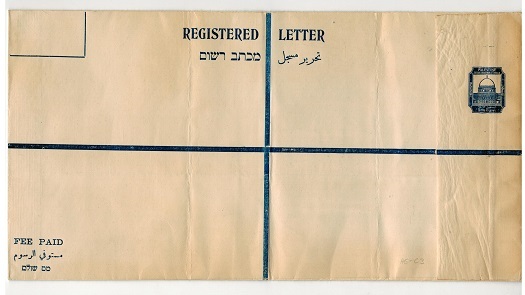 use of 'PALESTINE POSTS,TELEGRAPHS & TELEPHONE' envelope used locally (central fold) and cancelled by JERUSALEM roller strike. Black boxed ACCOUNTS BRANCH/ POSTS & TELEGRAPHS/JERUSALEM b/s. 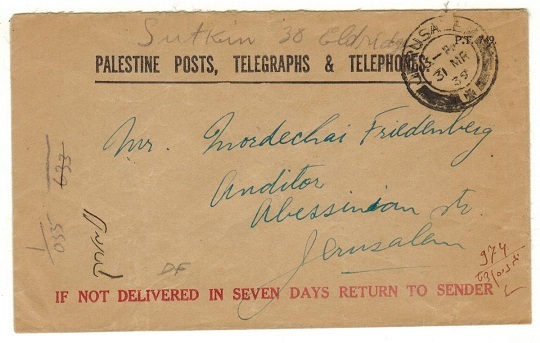 PALESTINE - 1939 use of 'PALESTINE POSTS TELEGRAPHS & TELPHONES' envelope from JEREUSALEM. 1939 (MR.31.) 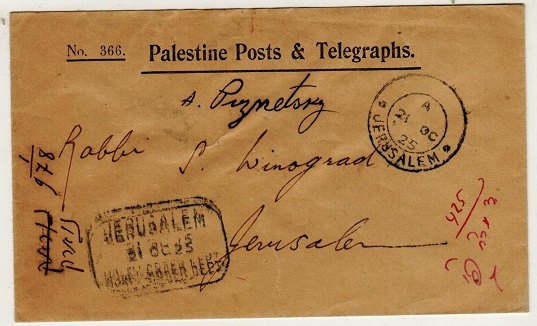 use of 'PALESTINE POSTS,TELEGRAPHS & TELEPHONE' envelope used locally and cancelled JERUSALEM. PALESTINE - 1946 'C&W LIMITED' telegram and telegraph form used at TEL-AVIV. 1946 (APR.21.) 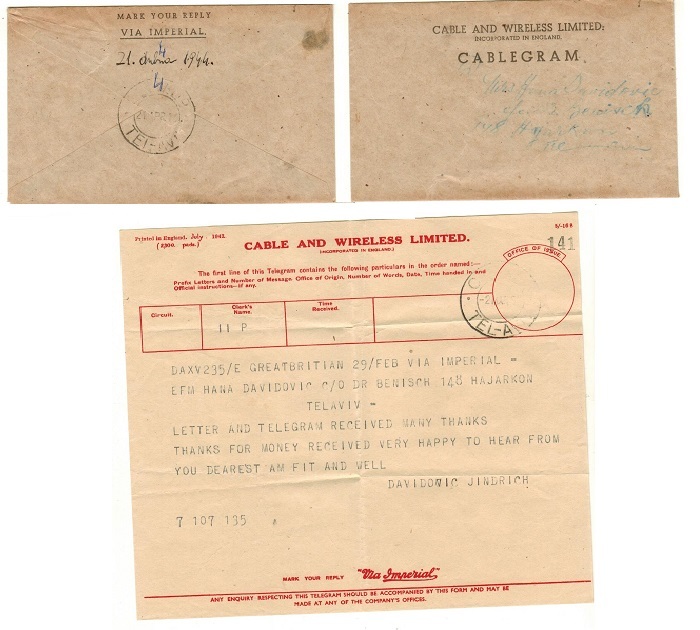 use of CABLE AND WIRELES LIMITED/CABLEGRAM envelope addressed locally and cancelled by C&W LTD/TEL-AVIV cds on reverse side and complete with original telegram. 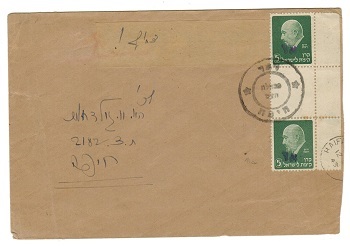 PALESTINE - 1942 censor cover to MEF with 'INDICATE LANGUAGE' instructional h/s. 1942 (MY.10.) 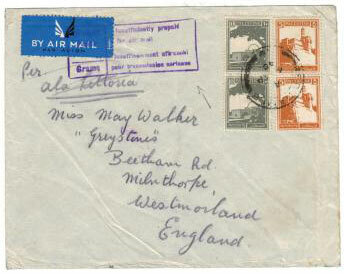 cover addressed to a soldier serving the 16 coy at 'The Buffs-MEF' bearing 10m grey adhesive tied HAIFA and with FPO 154 ARRIVAL B/S. 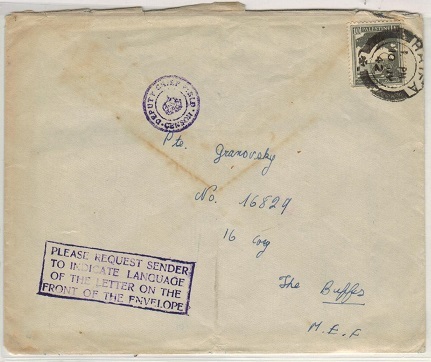 The cover is complete with the original letter and is struck by violet crowned DEPTY CHIEF FIELD CENSOR handstamp and struck by violet boxed PLEASE REQUEST SENDER/TO INDICATE LANGUAGE/OF THE LETTER ON THE/FRONT OF ENVELOPE instructional strike. 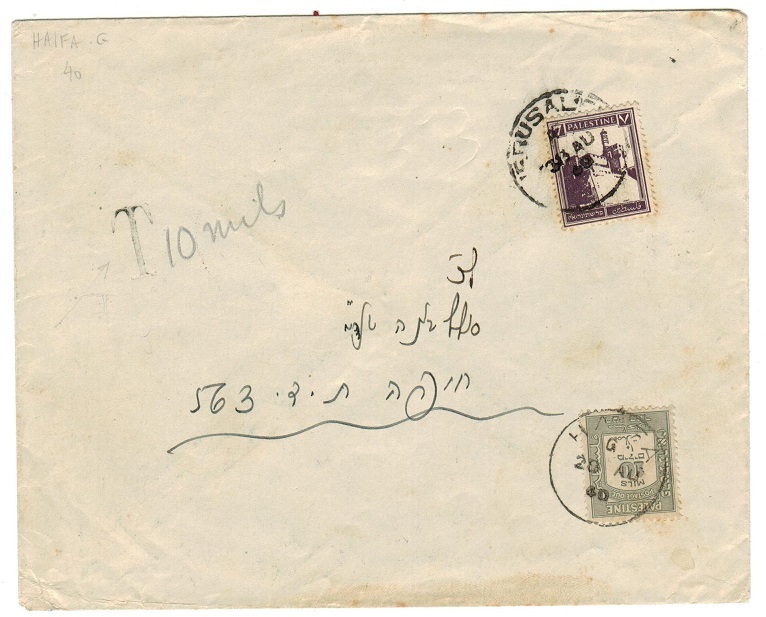 PALESTINE - 1939 underpaid local cover with 6m 'Postage Due' added. 1939 (AUG.13.) cover addresslocally bearing 2m adhesive tied JERUSALEM (aged and somewhat grubby) being under paid with violet boxed TO PAY tax mark and 6m orange-brown 'Postage Due' (SG D15) added. 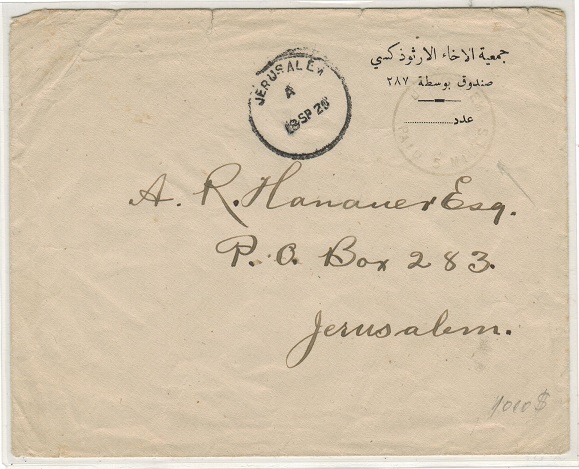 PALESTINE - 1920 'JERUSALEM/PAID/5 MILLS' local cover during the stamp shortage period. 1920 (SP.18.) 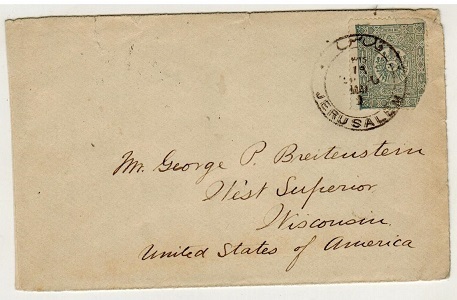 cover addressed locally cancelled by JERUSALEM s/r cds and struck by light rare JERUSALEM/PAID 5 MILLS h/s alongside. Proud type PD2. This is a rare handstamp used during the postage shortage period. PALESTINE - 1921 1p rate cover to USA used at MEA SHEARIM/JESLM. 1921 (29.NO.) 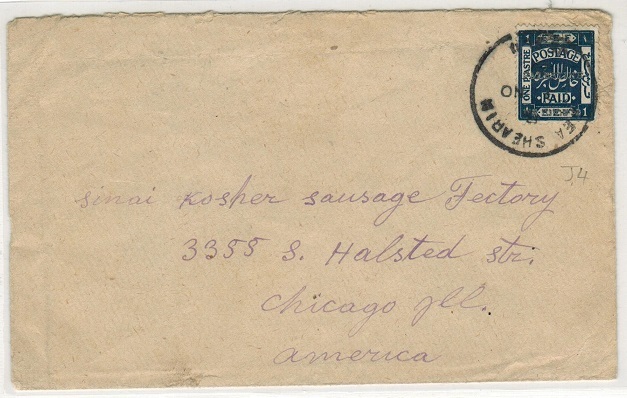 cover addressed to 'Kosher Sausage Factory' in USA bearing 1p deep indigo adhesive with silver overprint tied by scarce s/r MEA SHEARIM/JESLM cds. Proud type D4. 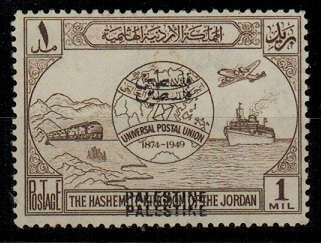 PALESTINE - 1940 'EXPRESS' cover used locally. 1940 (SE.5.) 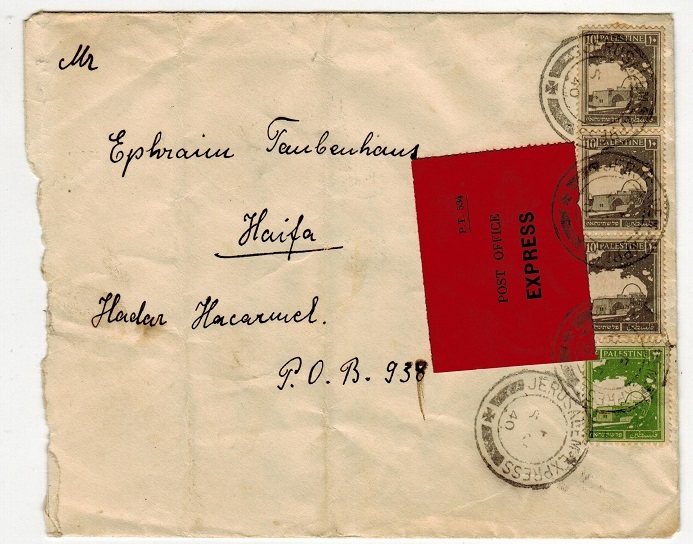 cover addressed locally to Haifa (central fold) bearing 6m and 10m (x3) adhesives at right edge tied in combination with black on red P.T.534/POST OFFICE/EXPRESS label by scarce d/r JERUSALEM EXPRESS cds's. (Proud type EXP2). 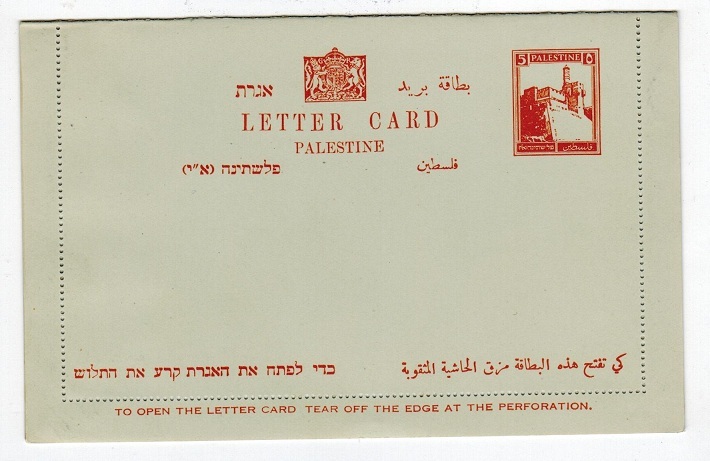 PALESTINE - 1945 10m grey postal stationery letter card uprated locally with 'EX' label. 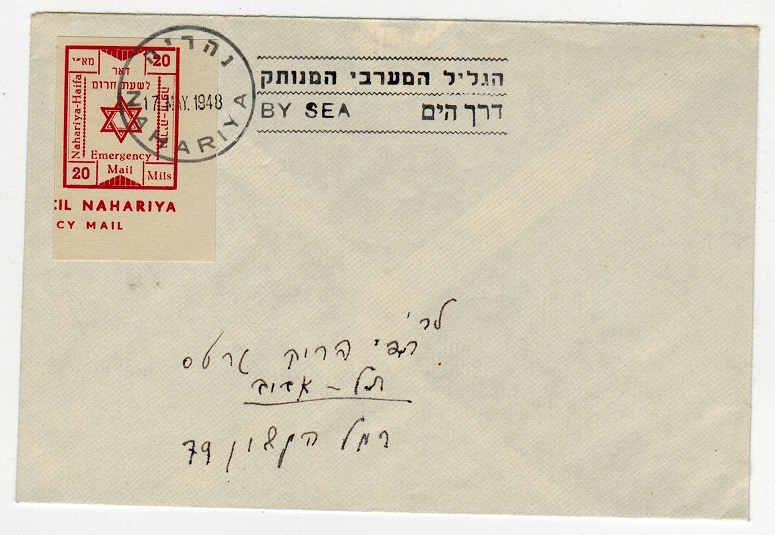 1945 10m grey on pale bluish postal stationery letter card (light surface creases) addressed to Jerusalem and bearing additional 20m adhesive pair tied HAIFA and with red and white 'EX' label at left. H&G 5. PALESTINE - 1916 'A.O.K.4' postcard use to Germany from the FELDLAZARETH 212 at Jerusalem. 1916 (28.11.) 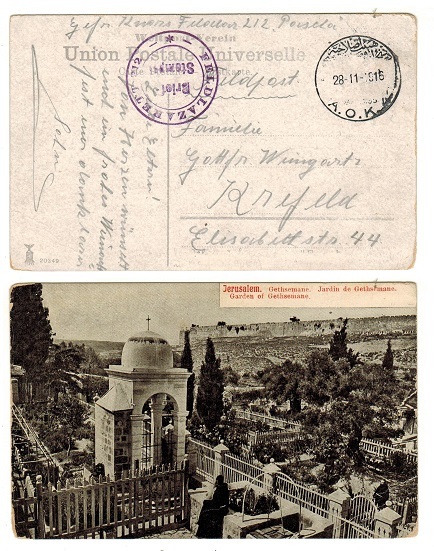 unstamped postcard use to Germany depicting 'Jerusalem-Jardin de Gethsemane' cancelled by the scarcer 'A.O.K. 4' cancel of Jerusalem used during the first World War. PALESTINE - 1946 65m rate registered 'EX' (Express) cover used at TEL AVIV. 1946 (DE.3.) heavily surfaced creased registered cover addressed locally bearing 15m (x3) and 20m adhesives tied by oval TEL AVIV/REGISSTERED cancels and with red on white 'EX' express label applied below. 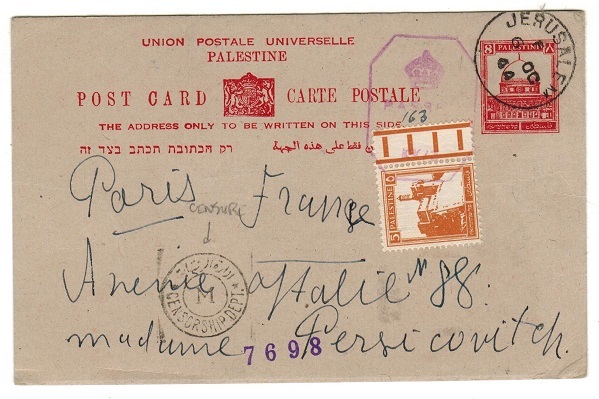 PALESTINE - 1932 8m deep red PSC uprated to France with 'PASSED/ KK/3' censor h/s applied. 1932 8m deep red on buff postal stationery postcard addressed to France bearing additional 5 mil adhesive cancelled by JERUSALEM s/r cds dated 6.OC.44. Struck by violet octagonal crowned PASSED/ KK/3 h/s (Little type 3a) with the addition of '163' inserted in manuscript. CENSORSHIP/M strike applied in transit at Egypt. H&G 6. PALESTINE - 1944 15m rate 'PASSED/ KK/22' postcard to UK. 1944 (AP.2.) 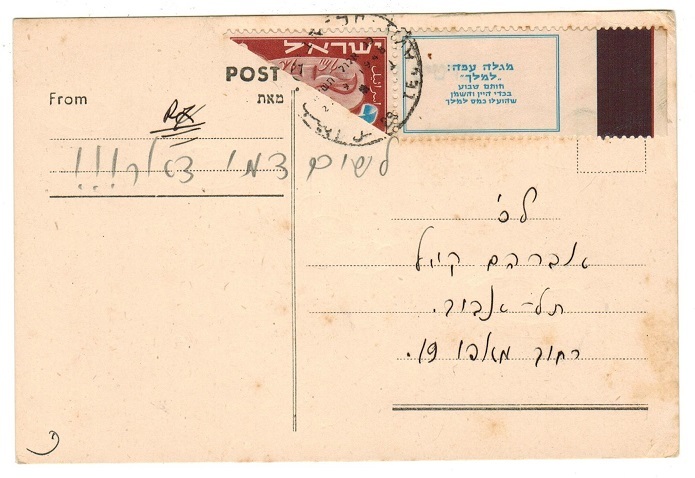 use of blank type postcard addressed to UK bearing 15m adhesive tied by NAHARIYA cds and struck by violet octagonal crowned PASSED / KK/22 censor strike. Little type 3a. PALESTINE - 1926 7m rate postcard use to UK used at JERUSALEM. 1926 (APR.21.) 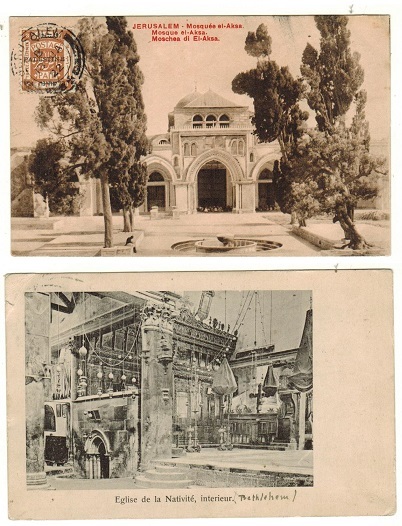 use of picture postcard addressed to UK depicting 'Grotte De La Nativite' bearing 7m adhesive overprinted PALESTINE and cancelled by JERUSALEM roller strike. 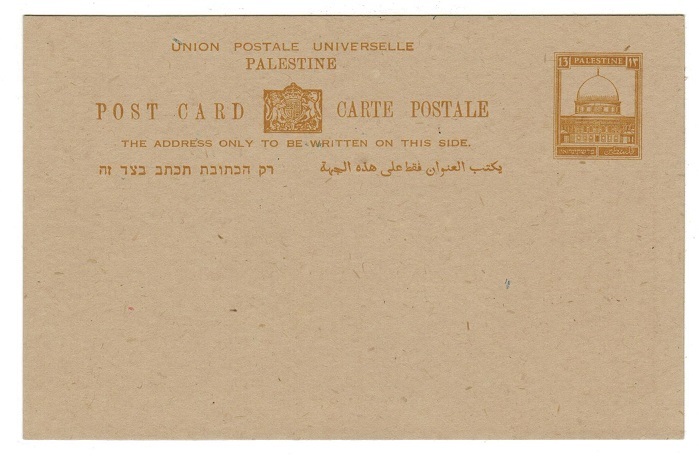 PALESTINE - 1938 under paid POSTAGE DUE cover applied at MOUNT CARMEL. 1938 (OC.28.) cover addressed to Haifa (some light tone spots) bearing 3m adhesive tied by PETAH TIQVA cds and being under paid having boxed TO PAY/MILS h/s applied with blue '4' inserted in manuscript and with 4 mils green 'Postage Due' added below and tied by MOUNT CARMEL cds dated 30.OC.38. Scarce. 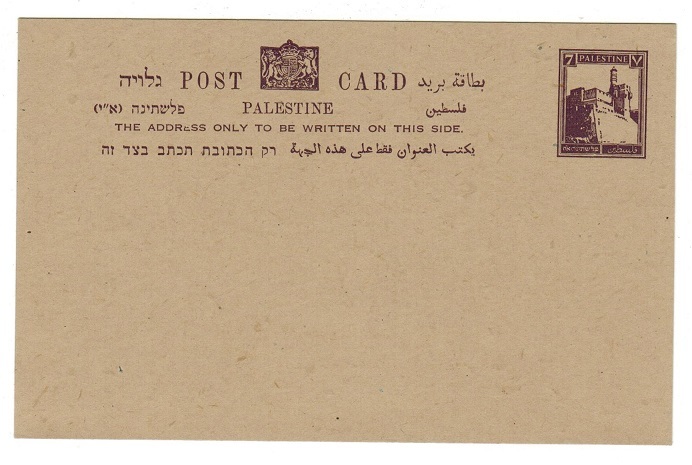 PALESTINE - 1935 inward under paid POSTAGE DUE cover. 1935 inward underpaid cover from Germany with boxed TO PAY/MILS handstamp applied with '10' inserted in manuscript and with 10 mils grey 'Postage Due' added and tied TEL AVIV and dated 26.MR.39. 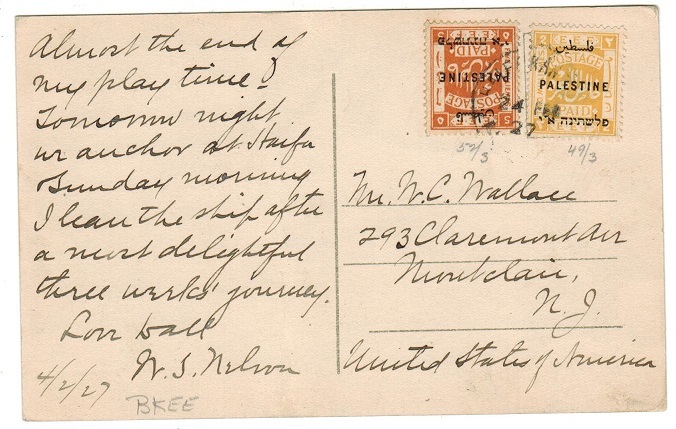 PALESTINE - 1942 RED CROSS MESSAGE envelope cancelled PALESTINE POSTAGE PAID. 1942 (SP.23.) 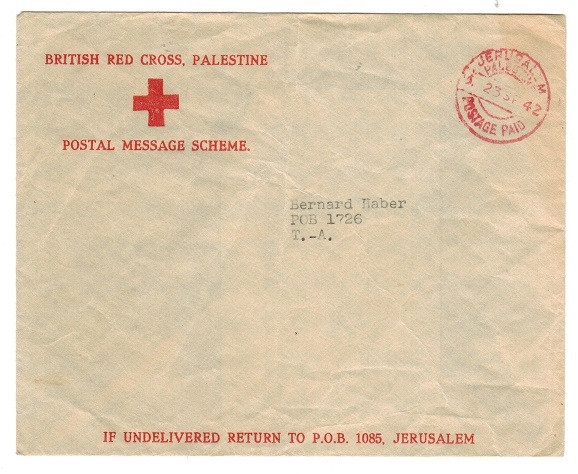 stampless BRITISH RED CROSS PALESTINE/POSTAL MESSAGE SCHEME envelope addressed locally cancelled by red JERUSALEM/PALESTINE/POSTAGE PAID cancel. Light central fold but scarce. PALESTINE - 1941 8m rate censored postcard use to UK. 1941 (DE.25.) 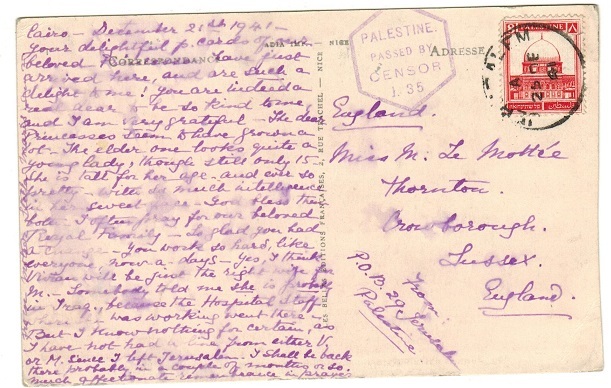 use of picture postcard addressed to UK bearing 8m adhesive tied JERUSALEM and struck by sexagonal PALESTINE/PASSED BY/CENSOR/J.35 h/s in violet. PALESTINE - 1940 10m rate FPO/121 censored postcard use to UK. 1940 (MY.21.) 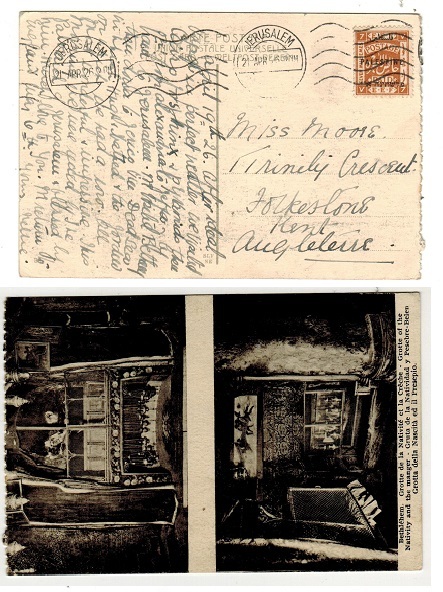 use of postcard addressed to UK depicting 'The Church of the Gethsemane' bearing 10m adhesive tied by FIELD POST OFFICE/121 cds with violet crowned boxed PASSED BY CENSOR/No.1056 h/s below. British troops stationed at Haifa. PALESTINE - 1941 13m rate censored postcard to USA. 1941 use of picture postcard addressed to USA depicting 'The Old City' bearing 13m adhesive tied by part JERUSALEM cds and struck by violet octagonal crowned PASSED/ KK/5 censor h/s. PALESTINE - 1942 7m dark violet PSC used locally from HAIFA with POSTAL GENERAL strike. 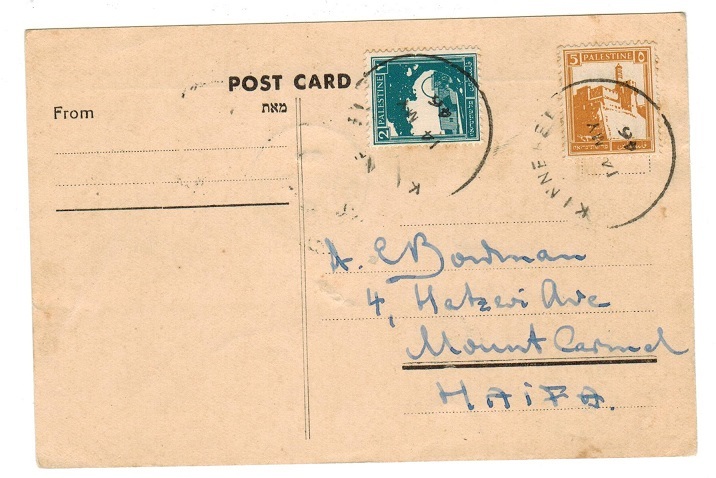 1942 7m dark violet on buff postal stationery postcard addressed locally cancelled by HAIFA cds dated 4.MY.47 and struck on front by violet POSTAL GENERAL strike. H&G 10. PALESTINE - 1929 13mils ultramarine (size k) RPSE (folds) unused. H&G 3. 1929 13mils ultramarine on cream registered postal stationery envelope with italic lettering (size K) in unused condition but with three vertical folds ironed out. H&G 3. PALESTINE - 1943 (circa) 'SHORT PAID' cover to Bulgaria. 1943 (circa) cover addressed to Bulgaria bearing 3m,4m,6m and 7m adhesives (all uncancelled) and struck at right by scarce black boxed THIS ITEM IS SHORT PAID….MILS/IT MUST BE FULLY PAID BEFORE IT/CAN BE DISPATCHED TO DESTINATION. '20' inserted in manuscript. 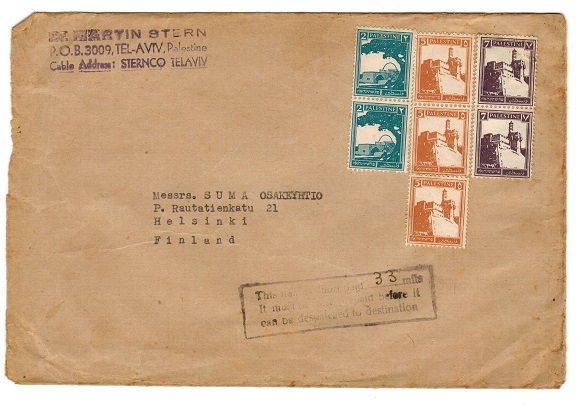 PALESTINE - 1943 (circa) 'SHORT PAID' cover to Finland. 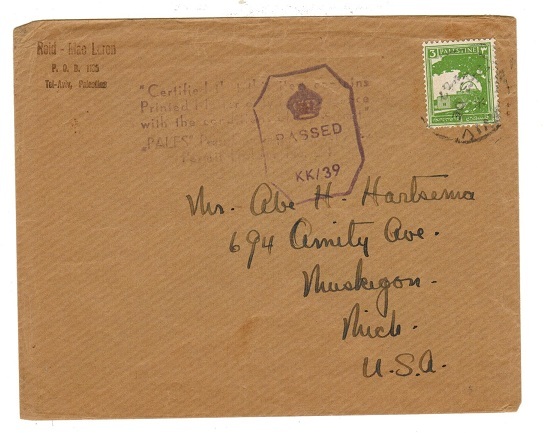 1943 (circa) cover addressed to Finland bearing 2m (x2), 5m (x3) and 7m (x2) adhesives (all uncancelled) and struck at right by scarce black boxed THIS ITEM IS SHORT PAID….MILS/ IT MUST BE FULLY PAID BEFORE IT/CAN BE DISPATCHED TO DESTINATION. '33' inserted in manuscript. 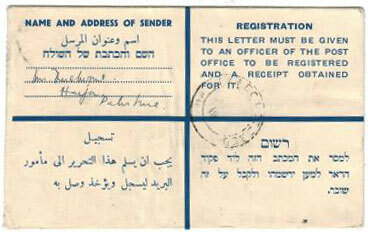 PALESTINE - 1945 use of INTERNATIONAL REPLY COUPON issued at TEL NORDAU TEL AVIV. 1945 (NO.26.) 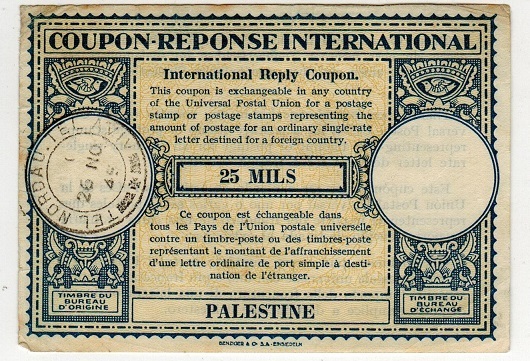 issued 25 mils INTERNATIONAL REPLY COUPON/PALESTINE cancelled TEL NORDAU TEL AVIV. Scarce. 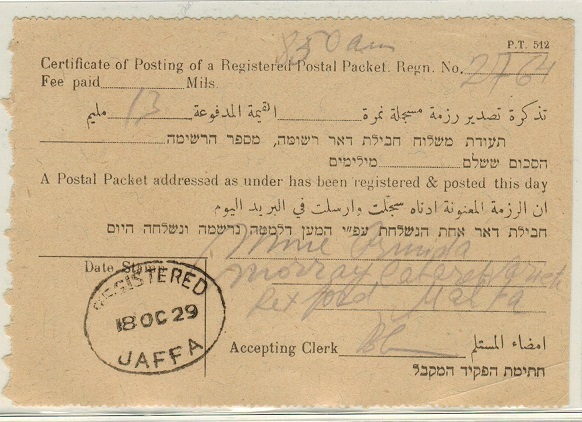 PALESTINE - 1929 CERTIFICATE OF POSTING receipt used at JAFFA. 1929 (OC.18.) 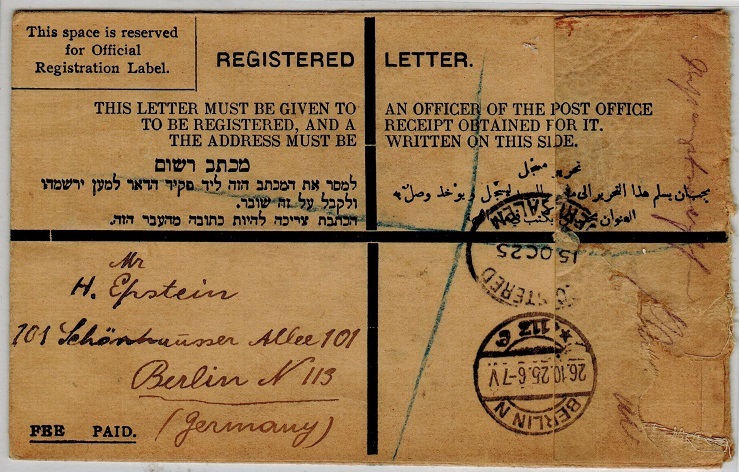 use of a official CERTIFICATE OF POSTING receipt cancelled by oval REGISTERED/JAFFA cancel. PALESTINE - 1949 TELEGRAPH receipt used at HAIFA HADAH HACARMEL. 1946 (OC.8.) 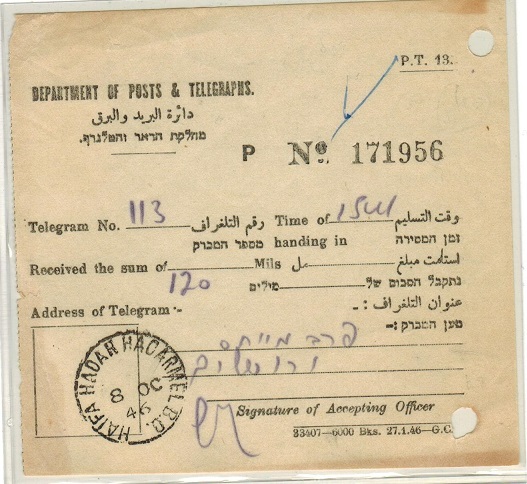 use of DEPARTMENT OF POSTS & TELEGRAPHS telegram receipt cancelled by HAIFA HADAH HACARMEL B.B. cds. TRANSJORDAN (Occ. Of Palestine) - 1949 50m UPU mint with OVERPRINT DOUBLE. SG P34. 1949 50m dull green 'UPU' issue of Transjordan in fine mint condition overprinted PALESTINE during the occupation and showing the variety OVERPRINT DOUBLE. SG P34. TRANSJORDAN (Occ. Of Palestine) - 1949 1m UPU mint with OVERPRIN DOUBLE. SG P30. 1949 1m brown 'UPU' issue of Transjordan in fine mint condition overprinted PALESTINE during the occupation and showing the variety OVERPRINT DOUBLE. SG P30. PALESTINE - 1945 15m blue on white RPSE (size G) unused. H&G 9. 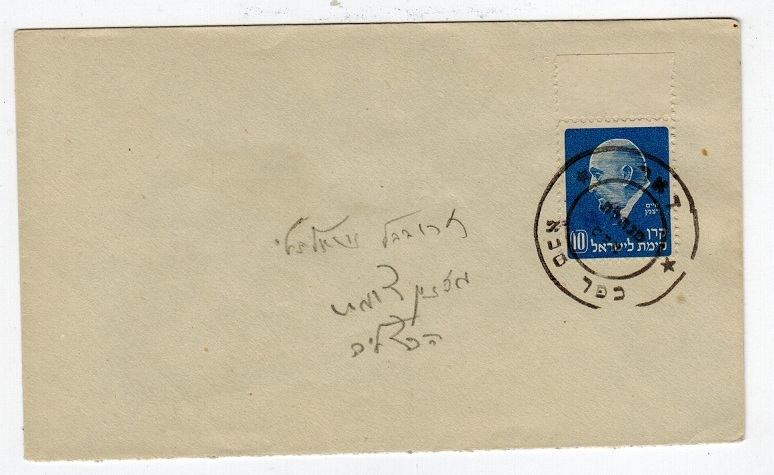 1945 15 mils blue on white registered postal stationery envelope (size G) with 'Fee Paid' missing but with 15 m value in both English and Hebrew. Fine unused condition. H&G 9. PALESTINE - 1945 13m ochre brown PSC unused. H&G 11. 1945 13 mils Ochre brown on buff postal stationery postcard in fine unused condition. H&G 11. PALESTINE - 1942 7m dark violet PSC unused. H&G 10. 1942 7 mils Dark violet on buff postal stationery postcard in fine unused condition. H&G 10. 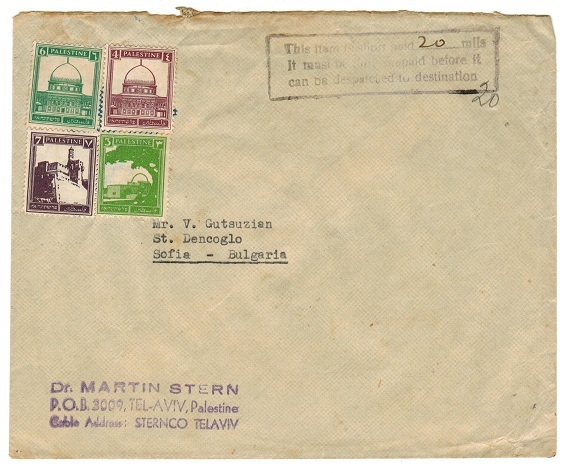 PALESTINE - 1931 2m blue-green postal stationery wrapper uprated locally. H&G 1. 1931 2 mils blue- green on buff postal stationery newspaper wrapper addressed in Arabic & bearing additional 2 mils adhesive tied by JERUSALEM cds dated 1948. H&G 1. PALESTINE - 1934 4m local postcard use at KEFAR SAVA. 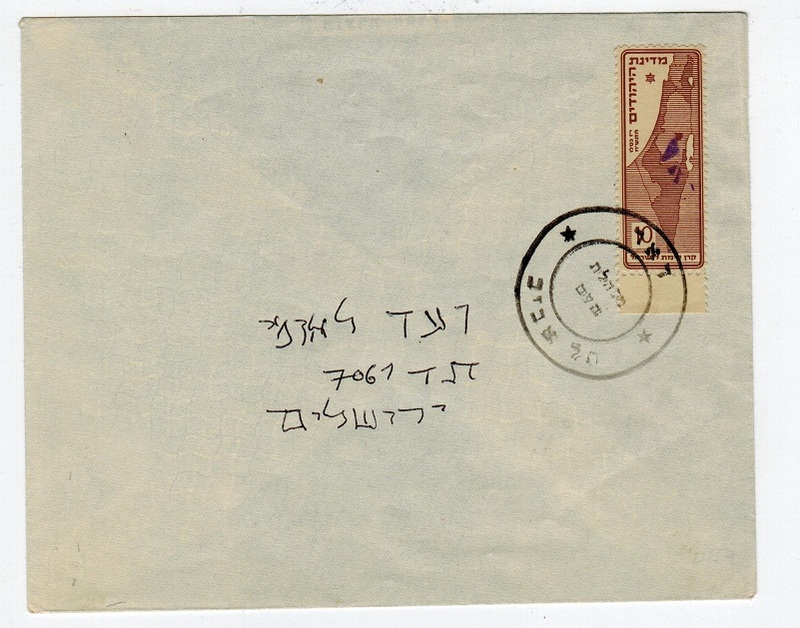 1934 (NO.1) use of 'Blank' type pre-printed postcard addressed locally to Haifa bearing 4m purple adhesive tied by KEFAR SAVA cds. 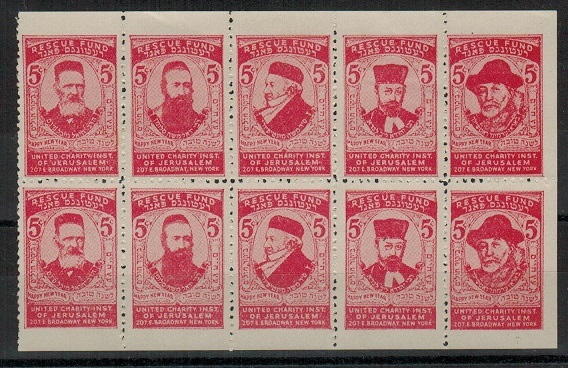 PALESTINE - 1932 8m red PSC uprated to Austria and used at QIRYAT HAIM. H&G 6. 1932-33 8 mils red on buff postal stationery postcard addressed to Austria and bearing additional 2m adhesive tied by QIRYAT HAIM cds dated 4.NO.38. H&G 6. PALESTINE - 1932 8m red PSC uprated to Austria and used at HAIFA. H&G 6. 1932-33 8 mils red on buff postal stationery postcard addressed to Austria and bearing additional 2m adhesive tied by HAIFA cds dated 30.MR.38. H&G 6. PALESTINE - 1948 20m rate EMERGENCY MAIL cover. 1948 (MY.17.) local cover bearing 20m red on cream EMERGENCY MAIL adhesive tied by NAAHARIYA/BY SEA cds. Unusual item. 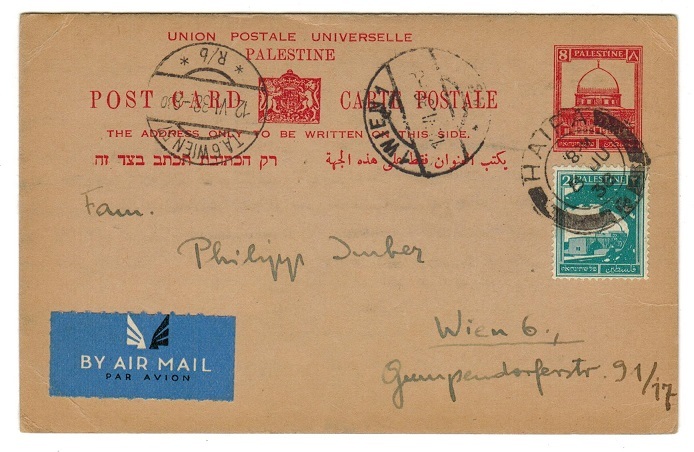 PALESTINE - 1936 underpaid cover with 'Postage Dues' applied. 1936 (OC.26.) local unstamped cover cancelled JERUSALEM with blue manuscript 'T' tax mark applied and violet boxed TO PAY/MILS strike with '10' inserted in red crayon and with 2m yellow and 8m red 'Postage Dues' added (SG D13+D16) and tied HAIFA and dated 27.OC.36. 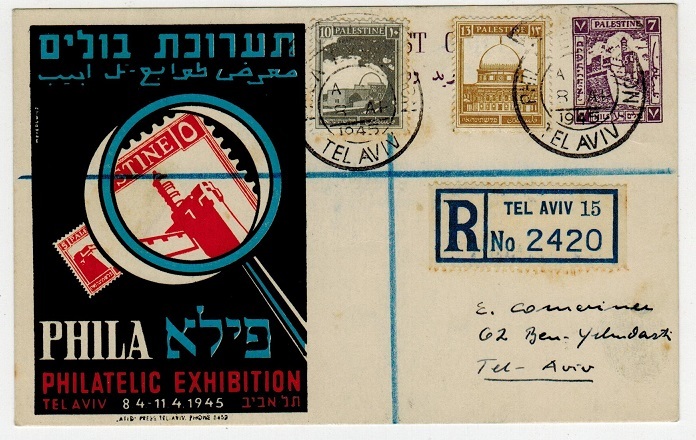 PALESTINE - 1946 registered local cover used at 'PHILATELIC EXIBITION' at TEL AVIV. 1946 (DE.22.) registered local cover bearing 3m together with a fine central gutter marginal pair of the 4m and 7m adhesives showing 'pillars' cancelled by hooded REGISTERED/PHIL. EXHIBITION cancels used at TEL AVIV. PALESTINE - 1948 10m BISECT on local postcard used at TEL AVIV. 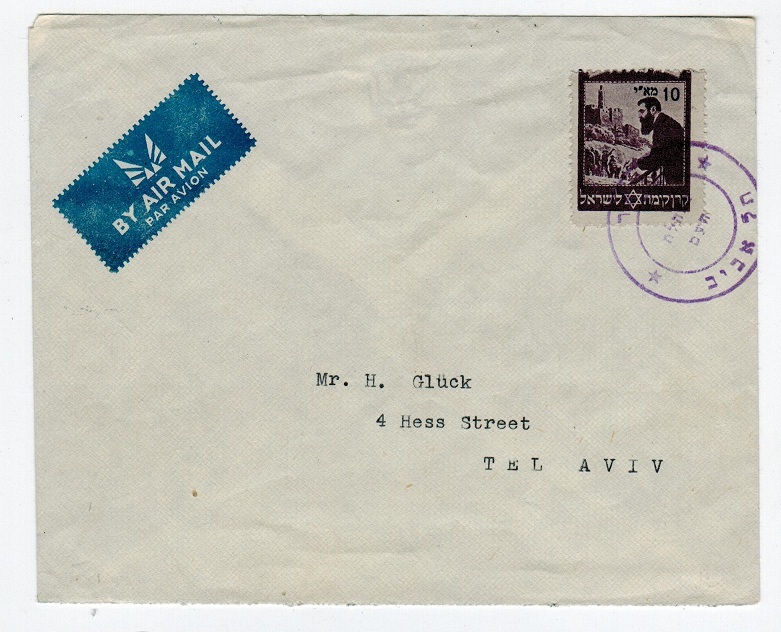 1948 locally addressed 'blank' type postcard (no message) bearing a example of the 10m adhesive DIAGONALLY BI-SECTED and attached to flying tab cancelled on the First Day of issue by TEL AVIV cds dated 26.9.1948. Unusual item. 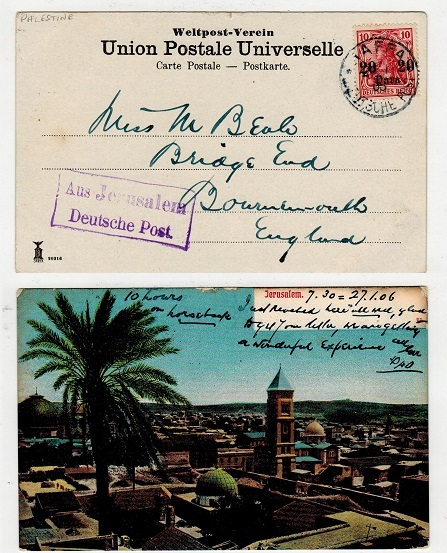 PALESTINE - 1905 AUS JERUSALEM/DEUTSCHE POST 10pfg rate use of postcard to UK. GERMAN OFFICES - 1905 (29.1.) 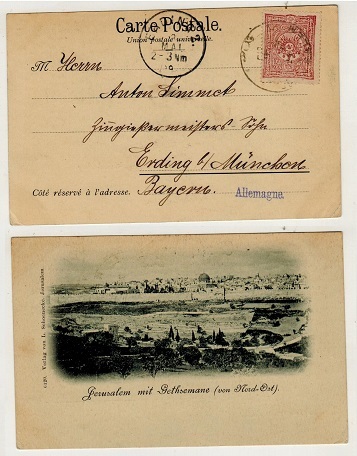 use of picture postcard addressed to UK depicting 'Jerusalem' bearing Germany 10pfg adhesive overprinted 20-20/PARA and cancelled by JAFFA/DEUTSCH POST cds and struck at lower left by scarce violet boxed AUS JERUSALEM/DEUTSCH POST h/s. 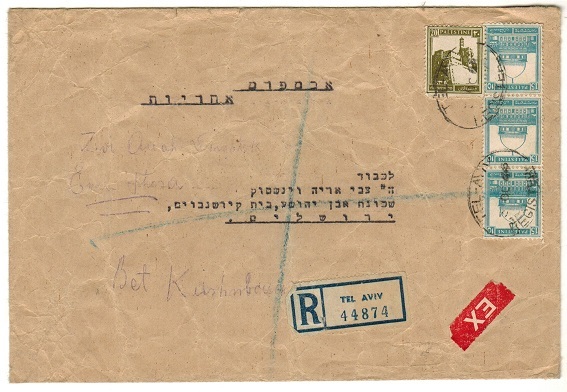 PALESTINE - 1946 INSUFFICIENTLY PRE-PAID cover to Switzerland used at RAMAT. 1946 (JY.23.) 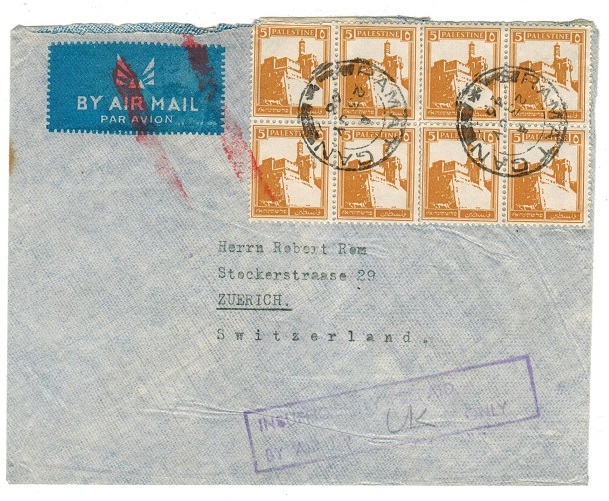 cover addressed to Switzerland bearing 5m orange in a fine block of eight cancelled by RAMAT GAN cds and struck below by violet boxed INSUFFICEINTLY PRE-PAID/BY AIR TO…. ONLY h/s with 'UK' inserted in manuscript. Complete with original letter. PALESTINE - 1942 censor cover to UK with INSUFFICIENTLY PREPAID handstamp applied. 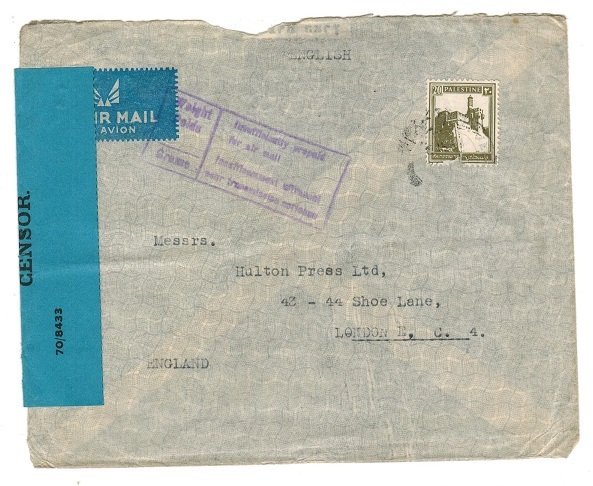 1942 cover addressed to UK bearing 20m adhesive cancelled by smudged HALFA cds and with black on blue PC 22./OPENED BY/CENSOR/ 70/8433 label at left. (Little type 6B2). Struck on front by violet boxed INSUFFICIENTLY PREPAID/FOR AIR MAIL handstamp. 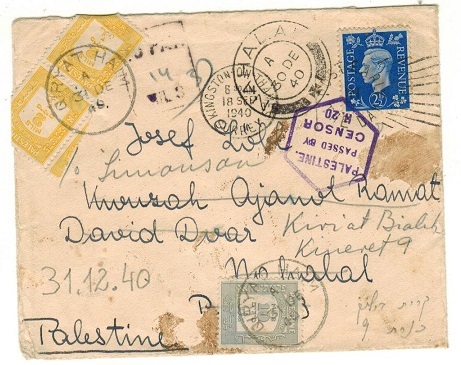 PALESTINE - 1942 censor cover to UK. 1942 (SEP.30.) 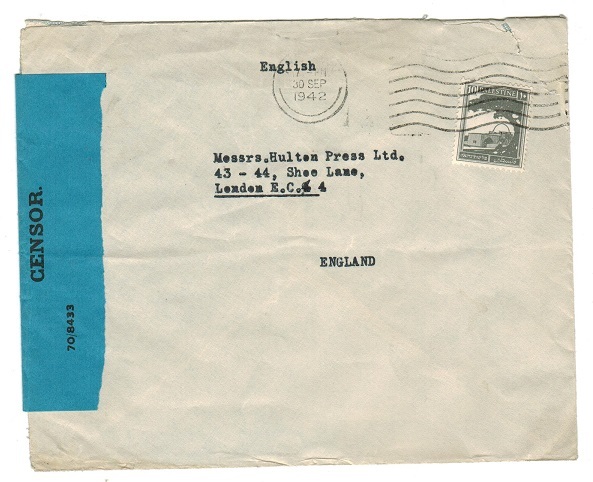 cover addressed to UK with 10m adhesive cancelled on arrival and with black on blue PC 22./OPENED BY/CENSOR/ 70/8433 label at left. (Little type 6B2). PALESTINE - 1946 locally used postcard at 7p rate cancelled KINNERET. 1946 (MY.14.) 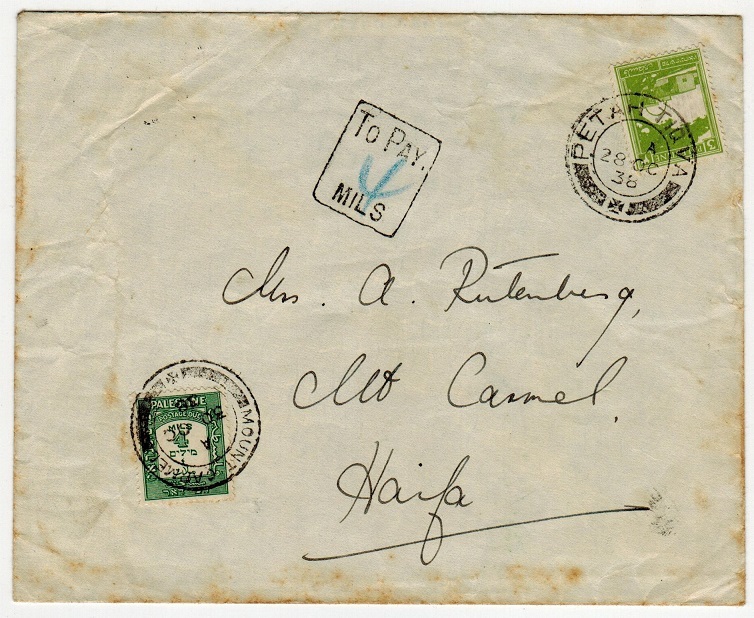 use of 'blank' type postcard addressed locally to Haifa bearing 2p and 5p adhesives each tied by the scarce KINNERET 'skeleton' postmark. 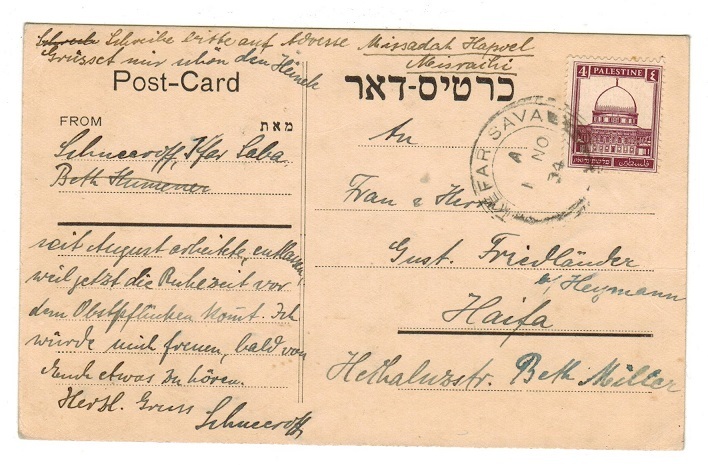 No message on reverse but with HAIFA transit and MOUNT CARMEL arrival. PALESTINE - 1941 underpaid local cover with POSTAGE DUES added. 1941 (AP.29.) underpaid local cover (stained at top) bearing 10p adhesive tied JERUSALEM with 'T' tax mark applied and violet boxed TO PAY/MILS handstamp with '12' inserted in red manuscript. 6m orange-brown 'Postage Due' pair added (SG D15) tied by HAIFA cds. 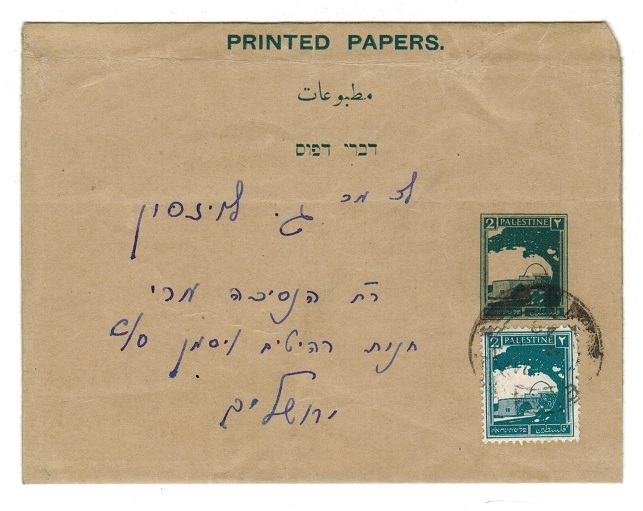 PALESTINE - 1940 underpaid local cover with POSTAGE DUES added. 1940 (AU.20.) local underpaid cover to Haifa bearing 7m adhesive tied JERUSALEM and struck at left by 'T' tax mark with '10mils' applied in manuscript alongside and with 10m pale grey 'Postage Due' added (SG D17) tied HAIFA on arrival. 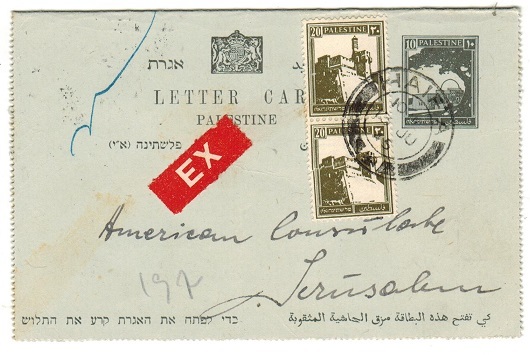 PALESTINE - 1939 underpaid local cover with POSTAGE DUES. 1939 (JA.17.) underpaid local cover (part of top left edge missing from rough opening and two file holes) bearing 3p adhesive pair tied JERUSALEM and struck by black boxed TO PAY/MILS handstamp with '4' inserted in manuscript. 4m green 'Postage Due' added on arrival (SG D14) tied TEL AVIV. PALESTINE - 1927 7m rate postcard to USA cancelled HAIFA KANTARA TPO SOUTH. 1927 (FE.24.) use of picture postcard addressed to USA at the correct 7m rate bearing 2m and 5m adhesives tied by HAIFA KANTARA TPO SOUTH cds. PALESTINE - 1940's INSUFFICIENTLY PRE-PAID cover to UK with WEIGHT/POIDS h/s. 1940's cover addressed to London and written in Hungarian (central fold) bearing 5m (x2) and 10m (x3) tied by weak TEL-AVIV cds's and struck on the front by violet boxed WEIGHT/POIDS/ GRAMS/INSUFFICIENTLY PREPAID/FOR AIR MAIL h/s. (Proud type I33). PALESTINE - 1945 7m PSC used locally at PHILATELIC EXHIBITION. H&G 12. 1945 7m Dark violet on white postal stationery postcard addressed locally (no message) with additional 10m & 13m adhesives tied by PHILATELIC EXHIBITION/TEL AVIV cds dated 8.AP.1945 with the card pre-printed by PHILATELIC EXHIBITION cachet. H&G 12. 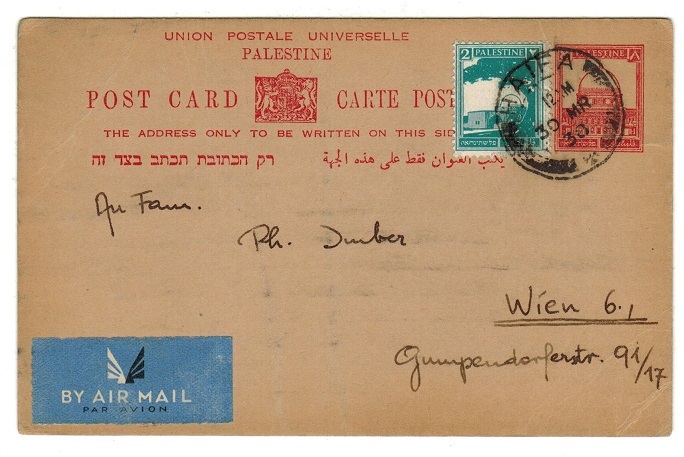 PALESTINE - 1932 8m deep red PSC addressed to Austria uprated with 2m from HAIFA. H&G 6. 1932-33 8m deep red on buff postal stationery postcard addressed to Austria bearing additional 2m adhesive and tied HAIFA and dated 8.JU.38. H&G 6. 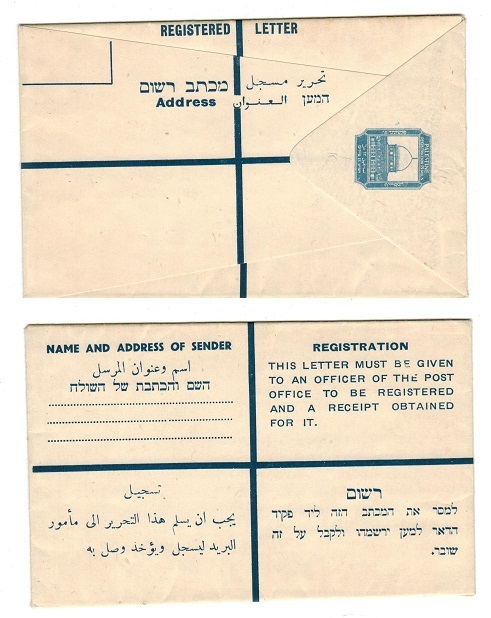 PALESTINE - 1952 JEWISH NATIONAL FUND 10c label BOOKLET. 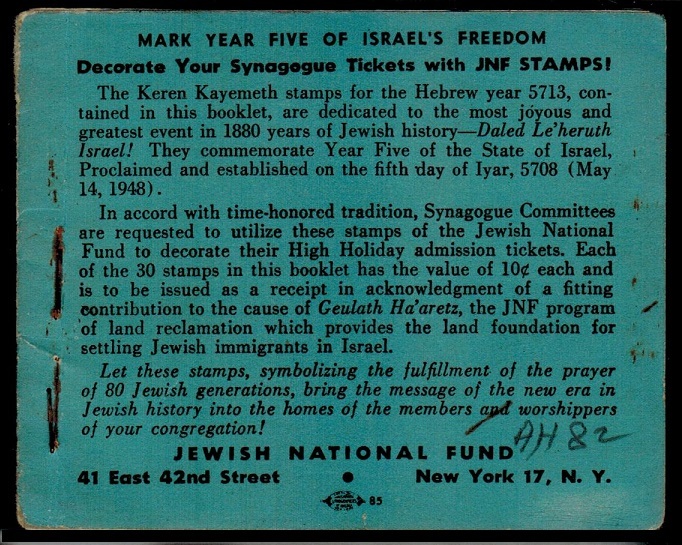 1952 black on blue JEWISH NATIONAL FUND label booklet with four complete panes of six remaining of the 10c label. (Originally 5 panes). A scarce item never the less. 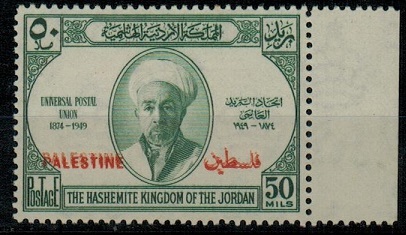 PALESTINE - 1922 uprated FORMULA RPSE used at JERUSALEM in 1925. 1925 (OC.15.) 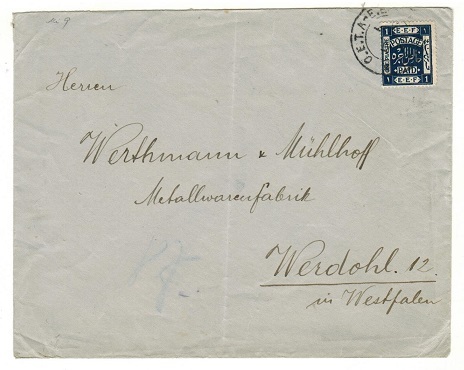 use of dark blue on buff FORMULA registered postal stationery envelope (size G) addressed to Germany bearing 1m,2m,13m and 1p adhesives tied to the reverse side by oval REGISTERED/JERUSALEM cancels. (707-49,998-18.8.22/Ptd at Greek Conv Press) imprint. A little roughly opened at flap with small piece missing. A rare FORMULA envelope. PALESTINE - 1940 (circa) 5m red perforated RESCUE FUND label pane of ten. 1940 (circa) 5 mils red on white perforated RESCUE FUND label pane of 10 on gummed paper. Unusual item. PALESTINE - 1937 3m PRINTED PAPER RATE cover to UK. 1937 (SEP.30.) 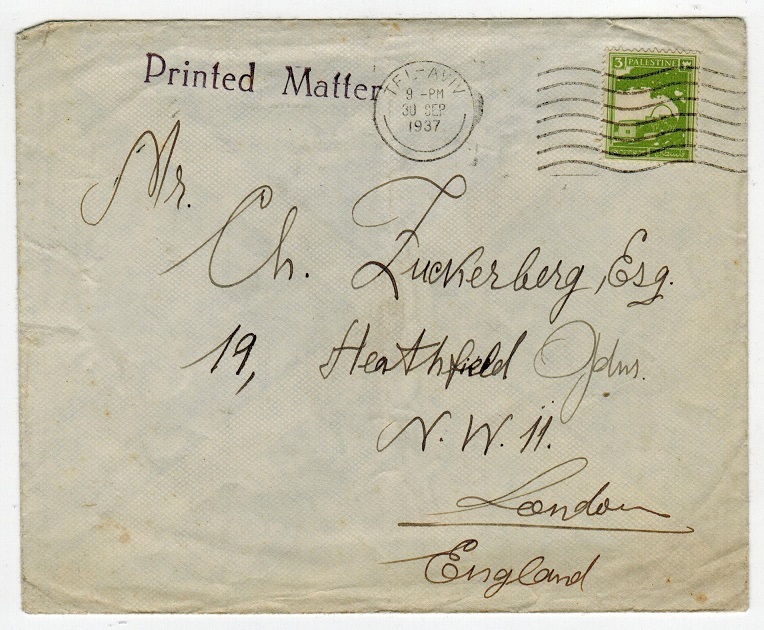 cover addressed to UK and handstamped PRINTED MATTER. Bears 3m green adhesive tied by TEL-AVIV roller barred strike. A scarcer 3m printed matter rate. PALESTINE - 1941 BASE PO/BWI cover use to Australia. 1941 (AP.1.) 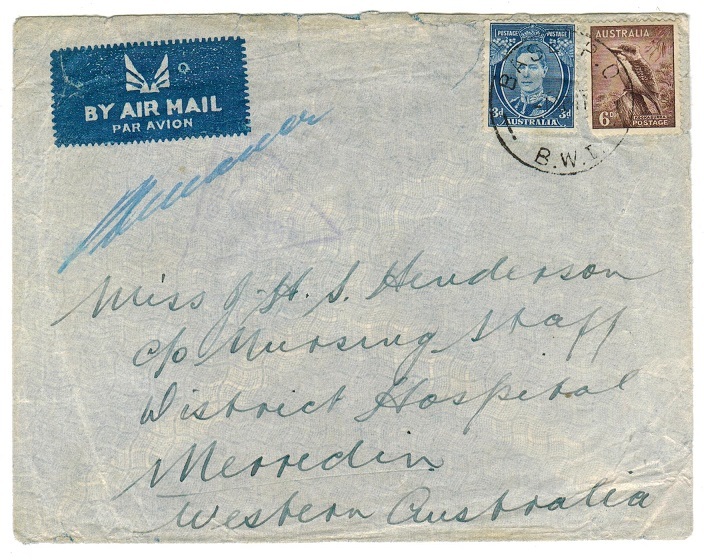 cover addressed to Merredin in Western Australia bearing Australian 3d and 6d adhesives tied by BASE P.O./B.W.I. Cds with violet triangular PASSED BY/CENSOR/No.6292 strike at left. Australian troops stationed in Palestine. PALESTINE - 1942 A.I.F.FIELD PO.No.8 cover use to Australia. 1942 (SE.4.) 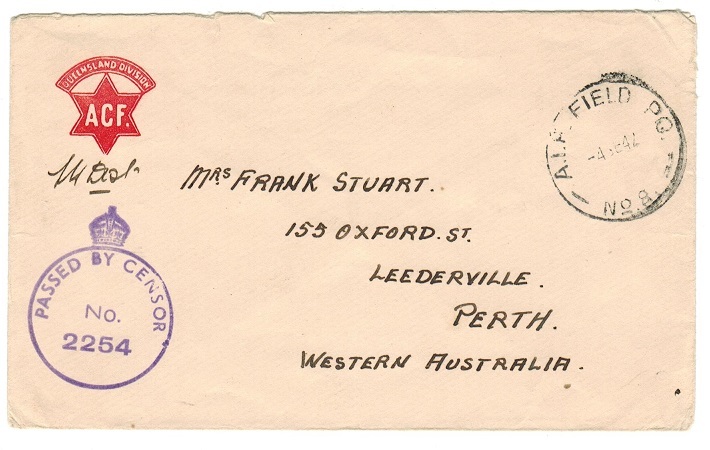 stampless 'Queensland Division ACF' pre-printed logo envelope addressed to Perth cancelled by A.I.F.FIELD PO/No.8 cds with violet crowned circle PASSED BY CENSOR/No.2254 censor at left. Australian troops stationed at Nazeriet in Palestine. 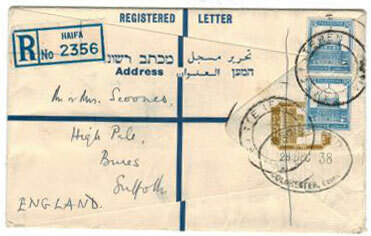 PALESTINE - 1941 (circa) FPO use of honour envelope to UK. 1941 (circa) green on buff ACTIVE SERVICE honour envelope addressed to UK bearing 10m and 50m adhesives tied by light FIELD POST OFFICE cds. 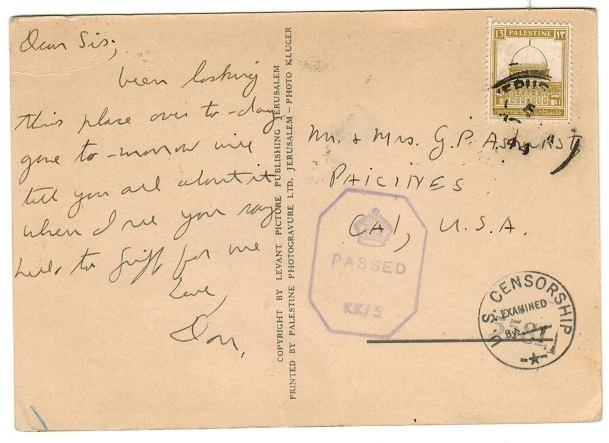 PALESTINE - 1943 censored 'OAS' cover addressed to Egypt from British troops. 1943 (FEB.14.) 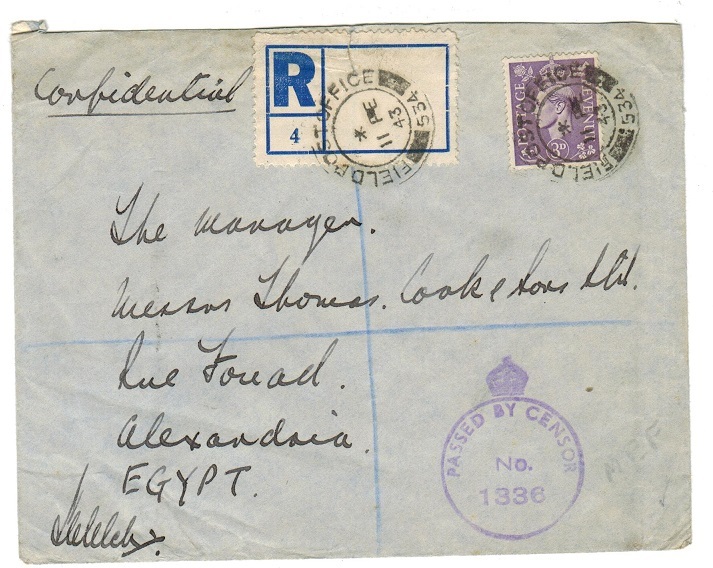 registered cover addressed to Egypt bearing GB 3d adhesive tied FIELD POST OFFICE/534 cds with violet crowned circular PASSED BY CENSOR/No.1336 h/s below. This cover was sent postage free with the registered fee of 3d being due. Troops stationed at Palestine. 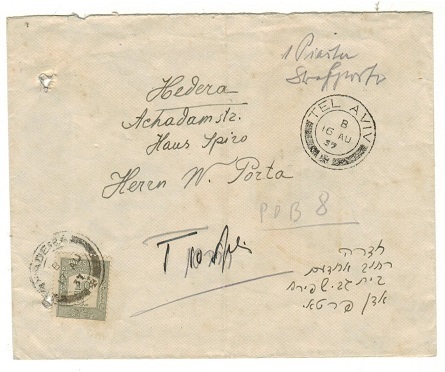 PALESTINE - 1923 cover to Italy used from SAFAD. 1923 (JU.20.) 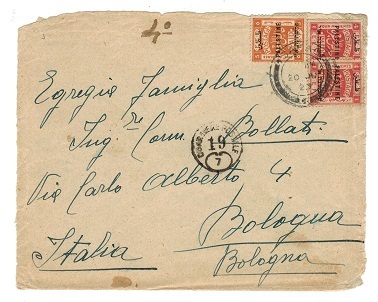 aged cover addressed to Italy (ex reverse flap) bearing 4m pair and 5m adhesives tied by SAFAD cds with circular DUARIMERE POSTALE/19/7 mark and BOLOGNE/CENTRO arrival b/s. PALESTINE - 1948 local cover with HAIFA NAHLA B.U. cds. 1948 (MY.12.) 'Interim Mail Period' local cover bearing handstamped 5m green 'gutter' marginal pair tied by large d/r rubber cancel with part HAIFA NAHLA B.O. cds below and full strike on reverse. Used two days before the British Mandate ended and the State of Israel proclaimed. 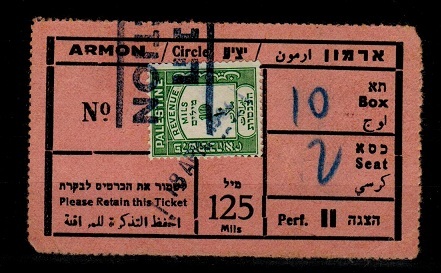 PALESTINE - 1940 (circa) 4m REVENUE adhesive used on 'Armon' cinema ticket. 1940 circa use of black on salmon 'Armon' cinema ticket bearing 4m green 'Revenue' adhesive (SG D14) cancelled by blue h/s. Unusual. PALESTINE - 1928 5m orange postal stationery lettercard unused. H&G 2a. 1928 5 mils orange postal stationery letter card in fine unused condition. H&G2a. PALESTINE - Local INTERIM PERIOD cover. PALESTINE - 1942 PALES/PERMIT HOLDER NO.24 cover to USA. 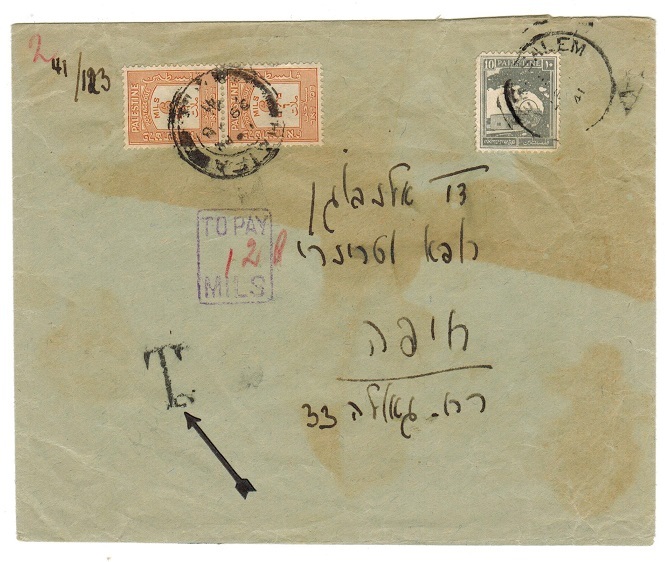 1942 (DE.23) cover to USA bearing 3 mils (SG91) tied by TEL AVIV cds with special violet five lined PALES/PERMIT HOLDER NO.24 h/s with violet crowned octagonal PASSED KK39 strike. PALESTINE - 1940 cover to UK with INSUFFICIENTLY PRE-PAID violet handstamp. 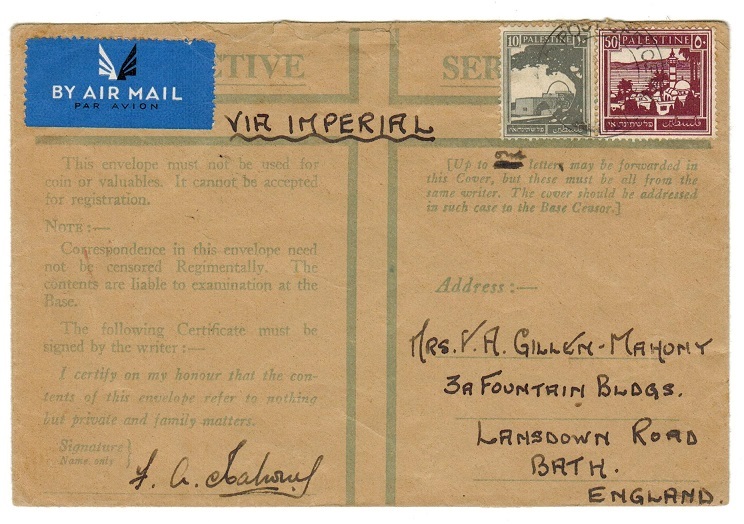 1940 (AP.4) cover to UK bearing 5m & 10m pairs (SG93+97) tied by ER RAMLE cds with scarcer violet boxed INSUFFICIENTLY PREPAID/FOR AIRMAIL instructional h/s at left. PALESTINE - 1938 13mils RPSE used. H&G7. 1938 13 mils ochre on white registered postal stationery envelope (size G) addressed to UK and bearing additional 15 mils pair (SG108) tied by REGISTERED/HALFA cds dated 20.DEC.38. H&G7.